It always seems to come a little too early in April, when snow can still be in the air and showers can be torrential, sending everyone dashing to the pavilion every half an hour and yet it can also bring beautiful soft mild days when the sun begins to hint at what the summer might bring and bird song is the soundtrack to the game. There used to be a lovely slow rhythm to the beginning of a new season, as though in and of itself it was reluctant to wake up, get out of bed and go down for a good breakfast, keen instead on getting five minutes of sleep. While today it’s up and about its business in the first week of April (5th April does seem indecently early) back in the day, the first county game was at the end of the month or even early May. Before that there were the games against Oxford and Cambridge University to play usually in the third week of April. 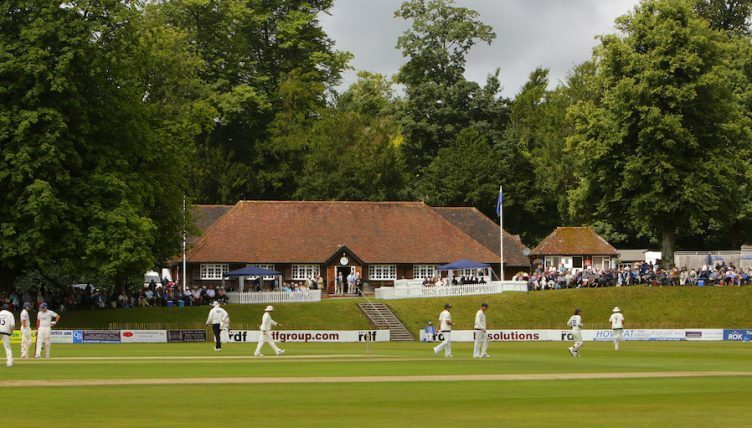 The first Benson and Hedges one-day game in the would happen in the third week and the minor counties would stretch their legs for the first time. Like a cuckoo in the distant trees, all of these things were early signs of the nascent campaign. And for the cricketer there are all the new season rituals to be gone through, such as the rigorous rubbing of linseed oil into your bats and replacing the rubber on the handle which is always a difficult job, more akin to putting on a very heavy duty condom. Then you’ve got to put your box on a boil wash and spray it with Brut 33 in the hope it will see you through to September once again without becoming a bio-hazard during a long knock in the mid-summer heat. Will your batting gloves see you through a new season? They always seem to easily get threadbare on the palm and thumb, the elastic on the cuff baggy. And then there’s that dodgy buckle on your pads that has never worked after you tripped over and landed heavily trying to unsuccessfully to avoid being run out. There is tape to buy for your fingers, even though you’ve never quite worked out when and why to use it. And you must once again try and get the cherry-polishing stain out of your whites as it makes it appear as though something in your crotch area is bleeding as soon as you pull them on and each year, they feel a little tighter. When I was a kid in the 70s, you also had to carefully re-white your spikes with something called, appropriately enough, whitener. I bought mine from Jack Hatfield’s sports shop in Middlesbrough. Remember sports shops? I never knew what it was but later suspected it was mildly narcotic as it seemed to combine the effect of sniffing glue with that of a shot of vodka, leaving your head swimming somewhat, but with nonetheless powerfully radiant boots. Then you have to clean out your cricket bag, untouched since late September and which inevitably always has an errant jockstrap in it. You hope it’s yours but suspect it may not be, so you try to put it in the washer without touching it for more than a nanosecond. The things you collect in your bag throughout a season is really quite an odd phenomenon as you don’t know how most of them even got in there. There’s always a spray of some sort which appears to have a medical use and smells of Deep Heat but you have no idea what it’s meant to treat. Then there’s the small, grey, limp towel which is always frayed at the edge, where did that come from? Also in there is a handful of silver gum wrappers around deposits of chewed gum hardened to a bullet over winter. Stuck in a corner along with crisp crumbs and sugar from some homemade shortbread is a small Biro, the sort you get in Argos which doesn’t work, as well as the nub of a pencil which is too hard to make a mark on a scorecard and has been in there for seven years now. You’ve got a crossword torn from a copy of a newspaper that you only got four clues done before you lost the first four wickets in the first four overs and had to go into bat obscenely early. Oh and there is always a comb in there too and there has been for eight years even though you’ve been bald for ten. Once cleaned out, you lay everything clean and new into your cricket bag, all neatly folded for the first and only time in the next six months, zip it up and you’re ready for another day defending the timbers or pounding the wicket. The spring is always the most challenging period to play cricket because the conditions vary more than at any time of the year. Wickets can be a bit green and take spin, can be slow with winter moisture, but when the sun warms the day making the air damp and heavy there is always the chance of some alarming swing. Stiff cold winds make you glad to get caught in the slips for 5. And because it is so changeable, all these things and more can happen in one session. These are the two or three jumper days when you’re fielding on the boundary on a slow-scoring morning. These are the days when you emerge from the pavilion twirling your bat and the first thing you do is look up at the sky. September seems too far away to imagine as you stride out for the first knock of the season and reach the crease just as large wet splashes of rain begin to fall, sending everyone scurrying back to the hutch. Yes, the joys of the new season are upon us. Time to take guard, time to mark out your run, time to spit on your hands and crouch down in the slips as a northeasterly removes your kidneys, because September seems an unbelievably long way away and anything is possible right here and right now.